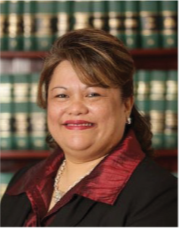 Ms. Ecube served as president of the Guam Bar Association (GBA) from 2009 to 2015 and prior to that, served as vice president of that organization for eight years. During her tenure as an officer of the GBA, she worked tirelessly on countless projects to advance the administration of justice and civic education, including helping to plan numerous Law Week events, continuing legal education seminars, and annual district conferences. In addition, Ms. Ecube has served on several court committees, including the U.S. Magistrate Judge Selection Committee, the Federal Public Defender Selection Committee, and the General Local Rules committee, and the Committee on Discipline. Ms. Ecube has zealously served the interests of countless indigent clients as a member of the court’s Criminal Justice Act Panel since 1996. In 2015, the court bestowed the Cristobal C. Dueñas Excellence Award upon Ms. Ecube for her tireless service to the court and legal community.